We are a modern company in machinery, equipment and technology, constantly renewing and updating our machinery park. The products we manufacture are widely accepted in the market, since we maintain competitive prices in the domestic and export markets. 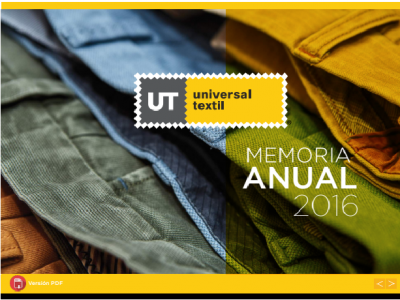 The distribution of the fabrics we produce is carried out at the national level directly by the company itself and through distributors who are highly reputable and economically solvent. On the other hand, the sale of the garments we manufacture is carried out in the domestic market directly to the marketing companies, while in the foreign market it is carried out through important importing and / or marketing companies of garments. The Company has an experienced and highly specialized administrative and technical body. Información Anual Requerida por la S.M.V.